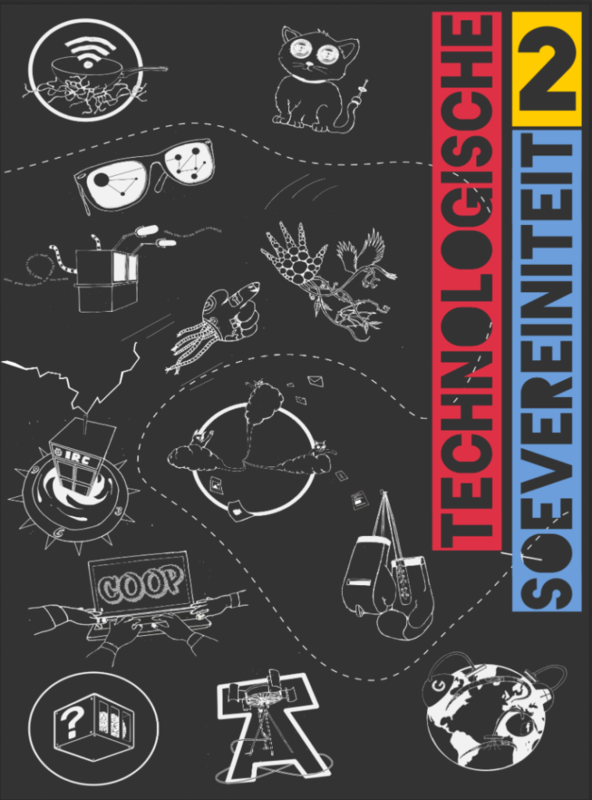 A couple of weeks, ago a part of the DATACTIVE team attended the book launch of the Dutch translation of ‘Technological Sovereignty’ at the Hackerspace TechInc in Amsterdam. The main talk at the book launch was given by one of the authors of the book, Spideralex, a feminist researcher on ICT for the public good. In her talk, Spideralex introduced the notion of technological sovereignty as being inspired by some reflections by Margarita Padilla, a feminist thinker and programmer. Padilla’s claim is that we ‘lost’ technological sovereignty: people are increasingly dependent on (digital) technologies, and even the seemingly active use of these tools is passive, because the people do not control the resources. Control is mainly delegated to big corporations. In response to this, increasingly, perceived loss, Spideralex and others went on a conceptual and practical journey to find, redefine, and reclaim technological sovereignty. Conceptually, they situated the notion of technological sovereignty in relation to other notions of sovereignty, such as, sovereignty in relation to land or territory, in relation to the body, and in relation to food. Especially the latter form and the existing cooperatives enacting food sovereignty in Catalonia have been inspirational for the authors to rethink the relation between technology, labor, fair production and distribution. ‘Food sovereignty is the right of peoples to healthy and culturally appropriate food produced through ecologically sound and sustainable methods, and their right to define their own food and agriculture systems. It puts those who produce, distribute and consume food at the heart of food systems and policies rather than the demands of markets and corporations. It defends the interests and inclusion of the next generation’ (Via Campesina, cited in “For Free Information and Open Internet” 2014, p.166). Along similar lines, Spideralex explained that technologies should not only be of tactical use; they should become a domain that is produced and controlled by the people, and dedicated to social change. Practically, a whole range of examples passed by. Such as a local alternative WIFI community network Guifi and feminist servers (run by feminists and dedicated to host websites supporting feminist issues). Sophie Toupin, a researcher from McGill University joining the talk, discussed a historical example of ‘project Vula’, an encrypted communication system used in the liberation struggle during the Apartheid regime (see Toupin 2016). Spideralex also addressed artisan techniques and reevaluated them as methods being learned within, and owned by, small communities. Finally she spoke about Calafou, an ‘eco-industrial postcapitalist colony’ in Spain just outside of Barcelona. In the ruins of an old industrial workers colony, the Calafou collective built their own post-capitalist society. They live together as a community, and they organise festivals and events. There is a hacklab, they work on free libraries, trans-hack feminism, and they run a biolab in which they measure and target pollution, especially metals in the environment. The discussion afterwards was very interesting. People discussed to what extent the notions of sovereignty and autonomy differed, and the localization of the term: in some places people might be more inclined to use sovereignty to describe their own practices than in other places. The situatedness of the understanding of the term also matters, of course, to the extent we can use it as an analytical concept. From a perspective on data activism, it is interesting to see how activists coin and develop conceptual notions to deal with the challenges of our time, in tandem with practical work; hence, to see ‘concept production’ in network cultures (Lovink and Rossiter 2012) in the making. The book is available in multiple languages: https://sobtec.gitbooks.io/sobtec2/. It was translated into Dutch by Kel, Ivom, Winston, Ptrc, Lara, Kwadro, and is downloadable here . This volume 2 is a follow up to a first volume that was produced in 2014 and is available in French, Spanish, Catalan and Italian (also available in the git repo). Half of the articles were also translated to English in For Free Information and Open Internet: Independent journalists, community media and hacktivists take action. The event was hosted by TechInc. More information about the event here. Lonneke van der Velden is postdoctoral researcher with DATACTIVE and a lecturer at the department of media studies at the University of Amsterdam. Her research deals with internet surveillance and activism. She is part of the editorial board of Krisis, Journal for Contemporary Philosophy, and is on the Board of Directors of Bits of Freedom. Toupin, Sophie (2016). “Gesturing Towards ‘Anti-Colonial Hacking’ and Its Infrastructure’, The Journal of Peer Production (9).